A city east of the Jordan, in or near Gilead (Num. xxxii. 1, 3; I Chron. l.c. ), and inhabited by the Amorites. It was taken by a special expedition sent by Moses to conquer it (Num. xxi. 32). From the Septuagint, which reads Ἰαζήρ for in Num. xxi. 24, it appears that Jaazer was on the border of Ammon. As an important city it gave its name to the whole of the surrounding territory (ib. xxxii. 1). Even a "sea of Jaazer" is mentioned in Jer. xlviii. 32 (but comp. the Septuagint rendering πολις Ιαζήρ, probably due to reading instead of ). Jaazer is stated to have been a fertile land fit for the raising of cattle (ib.) and a place having many vineyards (Isa. xvi. 8, 9; Jer. l.c.). It was occupied by the children of Gad (Josh. xiii. 25; I Chron. xxvi. 31), by which tribe it was allotted to the Merarite Levites (Josh. xxi. 39; I Chron. vi. 66 [A. V. 81]). In the time of David it seems to have been occupied by the Hebronites, who were descendants of Kohath (I Chron. xxvi. 31). It was chosen as one of the stations by David's officers who were sent to number the children of Israel (II Sam. xxiv. 5). According to Josephus ("Ant." xii. 8, § 1), Jaazer was captured and burned by Judas Maccabeus. 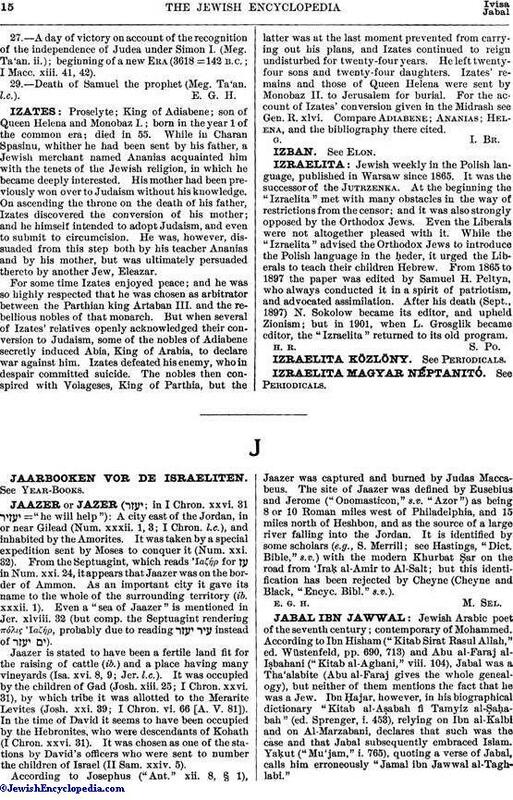 The site of Jaazer was defined by Eusebius and Jerome ("Onomasticon," s.v. "Azor") as being 8 or 10 Roman miles west of Philadelphia, and 15 miles north of Heshbon, and as the source of a large river falling into the Jordan. It is identified by some scholars (e.g., S. Merrill; see Hastings, "Dict. Bible," s.v.) with the modern Khurbat Ṣar on the road from 'Iraḳ al-Amir to Al-Salt; but this identification has been rejected by Cheyne (Cheyne and Black, "Encyc. Bibl." s.v. ).